Bovine spongiform encephalopathy is a neurological disease that damages the nervous tissue of a cow, especially the brain tissue. It is presumed to be caused by an abnormal prion protein. It is still unclear how the protein changes and why it causes neurological damage. The disease can only be spread by the ingestion of nervous tissue of an infected cow. Humans cannot be infected by this disease but get a variant of it called variant Creutzfeldt-Jakob disease (vCJD) by eating nervous tissue of an infected cow. Bovine spongiform encphalopathy is called mad cow disease because of the erratic behavior the infected animal exhibits. Cows can be infected for long periods of time and show no signs. The disease is fatal and has no known cure. The abnormal prion protein that causes bovine spongiform encephalopathy is a mysterious protein that is not yet fully comprehended, it begins as a normal prion protein that then rearranges its molecules changing it into the abnormal prion protein that causes this disease. The cause of the rearranging of molecules is not known. 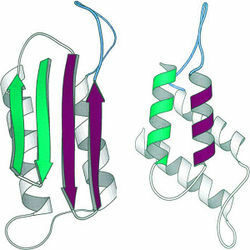 The prion causes other proteins to fold abnormally effectively causing them to become solid. The spongiform part of the name of this disease was given due to the resemblance of the brain to a sponge when the normal proteins solidify, resulting in brain tissue that has several small holes in it. The prion protein cannot be destroyed by heat and stays in the brain and spinal cord. It is speculated that other cows contracted this disease by eating the nervous tissue of an infected cow that was mixed into their feed. Some symptoms of Bovine spongiform encephalopathy are trouble with coordination and excessive aggressiveness. The cow could show nervousness or exaggerated reactions to touch and sound. The animal will be dizzy and eventually lose the ability to walk. Before that he could have weight loss, tremors, excessive nose licking, and be holding his head low. The animal can be infected for a long period of time before he shows any signs. Once he does the animal has about 2 weeks to 6 months left until the disease kills it because this disease is damaging neurologically. The loss of brain tissue is what causes all the changes in behavior and appearance that happens to these infected animals. This disease is fatal and has no known cure. The first case of bovine spongiform encephalopathy was diagnosed in 1986 in the United Kingdom. The epidemic started in U.K. and spread to North America. As it stands, the United States has had only 4 reported cases of bovine spongiform encephalopathy. This great success is due in part by the food ban done in 1988 by the English and in 1997 by the U.S. The food ban restricted the practice of using cattle meat as feed. The peak of the mad cow disease crisis was in January of 1993 in the United Kingdom. Their were almost 1,000 new cases every week at that time. Here is an informational video about bovine spongiform encephalopathy. ↑ Uknown, Author. The Basics of Mad Cow Disease WebMD. Web. 2 June 2014 (accessed). ↑ Uknown,Author. Creutzfeldt_Jakob_disease Mad Cow Disease MedicineNet. Web. 26 May 2014 (accessed). ↑ 3.0 3.1 Uknown,Author. Bovine spongiform encephalopathy AHLVA. Web. 1 June 2014 (accessed). ↑ Unknown, Author. What Causes BSE? BseReveiw. Web. 26 May 2014 (accessed). ↑ 5.0 5.1 5.2 Uknown,Author. Bovine Spongiform Encephalopathy AHLVA. Web. 1 June 2014 (accessed). ↑ Uknown, Author. The Basics of Mad Cow Disease Canoe.ca. Web. 1 June 2014 (accessed). ↑ 7.0 7.1 Uknown, Author. BSE Eden. Web. 30 April 2012 (Last Update). ↑ Uknown, Author. BSE CDC. Web. 21 February 2013 (Publication). This page was last modified on 20 January 2016, at 15:10.